It's a balmy 89 degrees under a baby blue sky in the middle of spring break and Goodyear Estrella Foothills freshman Max Schell is accepting and returning balls on the hard court at the Phoenix Tennis Center. Orange trees hug the chain-link fence that borders the court where Schell dances back and forth with his racket, his sandy brown hair curling over the black baseball cap he wears as coach Joey Blake stands in the background. The week off from school has afforded 14-year-old Schell the opportunity to have more time with Blake, and there's no place Schell would rather be. "I make tennis my first priority pretty much," Schell said, who sits 65th in the Unites States Tennis Association national rankings and is rated fourth in the Southwest Region. tutelage of Blake, who runs Topnotch Tennis, a program dedicated to developing high-performance junior players. Blake's coaching has been so invaluable that Schell has forgone participating in the high school tennis season because it would require him to cut his time with Blake. In order to play in matches, the team required Schell to attend three practices a week, Schell said. "I thought that might have brought my game down a lot, and I kind of wanted to keep my game sharp for the upcoming tournaments," he said. So instead of joining classmates on the courts at Estrella Foothills after school, Schell's mother drives him 35 minutes to the tennis center in Phoenix where he trains with Blake for two and a half hours every weekday. And considering Blake's background, skipping out on the chance to represent his school was a no-brainer for Schell. Blake "has been kind of a hidden gem here, not just in the West Valley but in the state and the region," said Schell's dad, John. 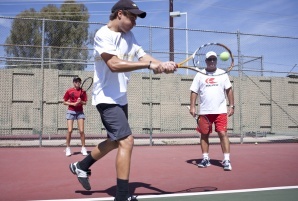 Blake has been mentoring tennis athletes for more than 20 years but has only operated his academy in the Valley for six. He started his own playing career when he was 6 years old, trailing behind his dad to the local tennis court. "I just took my racket and hit ball after ball after ball against the wall," Blake said. By the age of 10, Blake was playing in national tournaments. He started getting home schooled because by age 16 he was traveling to Europe and South Africa to compete. He won the NCAA Indoor title as a freshman at the University of Arkansas before turning pro the next year. He carried a No. 4 world ranking as an International Tennis Federation junior, was a U.S. Open Junior Doubles Champion and singles finalist and competed on the ATP Pro Tour before he tore all the ligaments in his wrist and forced to retire when he was 22 years old. "To this day, I can't accept change with my right hand," said the 43-year-old Blake. But he renewed his passion for tennis through coaching and has helped players reach the No. 1 U.S. ranking, national, Grand Slam titles and NCAA accolades. In the Valley, Blake trains about 20 athletes from elementary-aged kids to teens like Schell. The majority of his students are home schooled so they can maximize their training time with Blake. Schell is one of the few who trains part-time while attending public school, and Blake sympathizes with Schell's dilemma in wanting to play high school tennis but not wanting to sacrifice his growth within the sport. "It's really unfortunate, but tennis is different than football, basketball and these other sports," Blake explained. "Tennis is based on what you do nationally. Unfortunately, all these high school matches these kids play don't count towards national rankings." So for now, Schell is committed to Blake's program. He's considering switching to home schooling next year to have more time with Blake, but also to explore a hybrid option that allows home-schooled kids to participate in high school events such as playing with school teams. Competing for a Division I school, like UCLA, is the goal. "And then just see how it goes from there," Schell said.